Dryer Vent Cleaning Port St Lucie - WE TAKE THE CONTROL OF YOUR CLIMATE!! 1st Quality Restoration cleans clogged dryer vents in homes. This service can help homeowners get better performance from their dryers, reduce their electricity bills, and lessen the chance for house fires. Your Dryer Vent Needs Professional Cleaning Services! Make sure your dryer’s ventilation system is professionally cleaned to ensure it’s free of lint, debris, and other materials that reduce its efficiency by making it work longer and harder. This is no small matter; right now, the cost for a new dryer can run as high as $1700! You already know that appliances have a big impact on your energy bill. Running the dryer for longer periods of time will make that bill even higher. If saving money isn’t enough to convince you, consider that 92% of house fires that start in the laundry area are traced to dryers. These fires are also difficult to spot and put out before they cause major damage because people rarely stay in the laundry room once they’ve loaded and started the machines. The Consumer Product Safety Commission also warns that overheated dryers can cause fires, and recommends that a qualified service person cleans inside the dryer chassis where lint builds up. If you notice any of these problems, it’s a good indication that it’s time to call 1st Quality Restoration to clean and service your dryer ventilation equipment. Depending on how much you use your dryer, these signs can show up in as little as one year after a cleaning. It’s taking longer and longer to get your clothes dry. Clothing feels really hot when you remove it immediately after the dryer stops. Your dryer gets very hot during a cycle. Your laundry room gets hot and humid when the dryer is running. Your laundry room smells musty or smoky during or immediately after a drying cycle. Mr. Duct Cleaner goes far beyond competitors who just vacuum vents. We use industrial equipment with stiff bristle brushes that reach deep into the vent path to scrub away stuck-on debris. In some cases we even take the dryer vent apart to ensure 100% airflow. 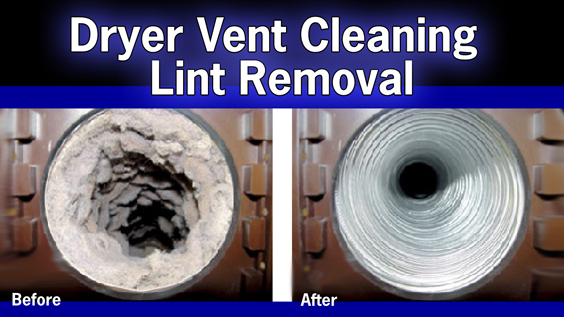 Lint You Remove From Your Dryer is Nothing Compared to Inside the Vent! Your dryer removes whatever doesn’t get rinsed off during the washing process. Think about all the lint you remove from the inside lint screen each time you use your dryer (you do this, right?). Imagine how much of it gets blown into the vent, year after year. You may be surprised by how much dust, lint, and lots of other debris is commonly found inside dryer ventilation pathways. It’s the result of all the stuff that gets blown off clothing, blankets, pet pillows and other items you’ve put through the laundry. In addition, many houses have screens in place to keep little visitors from getting inside dryer vent exits. We recommend removing these screens. Over time, lint will eventually build up, blocking the exit and backing up lint into the vent. Professional vent cleaning takes care of cleaning these screens as well. While we encourage customers to regularly vacuum behind and over the back of appliances, the fact is that home vacuums—and most shop vacuums, too—aren’t strong enough or can’t reach far enough to thoroughly clean vents all the way through. Think about how long that venting route is from your dryer to the outside of your home. It’s probably at least 15 feet, and may be as long as 25 feet! In some homes, the vent path literally goes through the roof. If you plan to put your home on the market, do yourself or your clients a favor and get the dryer vent professionally cleaned. According to the ASHI Reporter, the news service for the American Society of Home Inspectors, lack of servicing for dryer, air conditioning, and furnace vents is one of the 10 most common inspection problems its members encounter. If you can’t recall the last time someone looked into your dryer vents, it’s probably time to get them cleaned. Contact 1st Quality Restoration today to schedule a thorough and professional cleaning for your dryer vent.